Today is Hero Sidney Merkle’s seventh birthday, and she requested homemade pizza. (I’m so glad she didn’t ask for corndogs!) I had the pleasure of taking her out for a birthday date after school. First we got a sparkle mini donut at Starbucks and chocolate milk to go with it. Then we hit the sale rack at Old Navy. Now isn’t this adorable? And tomorrow I may get some shirts ironed! How nice to have just one shirt in the closet. No need to waste time deciding what to wear! For my husband it would be the number of clean black socks. If he’s down to one precious pair left you know the week fell to pieces. What a great coat!! Happy birthday to the missy. That’s a perfect seven-year-old smile. Happy Birthday Miss Cutie Hero? 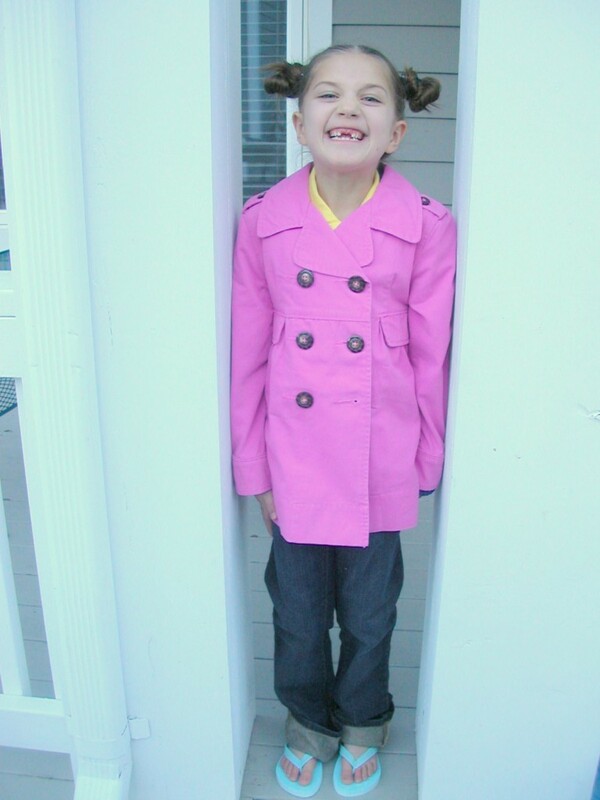 Adorable jacket- I may need to pop on over to Old Navy! And I don’t know whether or not to be encouraged or discouraged by the shirt situation: I keep believing I will have that under control once I’ve been washing and ironing for 20-30 years! I had to laugh, because so many days we find ourselves in the same boat. 🙂 Hope your weekend is restful! Aw, we both have 7 year old granddaughters born on the 25th. And they both have that toothless grin. Precious. I’ve been dying to know for a while: Where did the Merkles find the name Hero? I know it’s a name used in “Much Ado About Nothing” and it’s the name of the Greek hero Leander’s sweetheart, but why did they choose to use it? My daddy loves homemade pizza; it’s one of his favorite meals. Good choice. There you have it! We didn’t actually choose Hero for the Shakespeare character because I’ve always thought she was a bit of a dud actually. Haha, I know my week has been difficult when I see my husband fishing through DIRTY WHITE SOCKS before his daily 4-8 miles. Oh, it’s not a good feeling. Thank you for the explanation on the names! What a fun system–and I’m sure your girls love the meanings behind their names (or will love them, if they have the I-hate-my-name phase). I’ve often felt kind of bummed that “Heather” doesn’t have a meaning. And I haven’t been impressed by any pictures of the plant. It’s also interesting that you have fearlessly pilfered Classical and pagan names as well. You don’t know how encouraging it is to know there are days when there is only one ironed white shirt in Mr. Wilson’s closet. Thank you for sharing that. Love and miss y’all.